With similar features to the Operator II Plate Carrier, our Quick Release Plate Carrier features a different cummerbund and an integrated quick release system allowing rapid removal of your body armor & carrier from either shoulder. When the quick release tab is pulled, that shoulder and backside of the cummerbund detach. 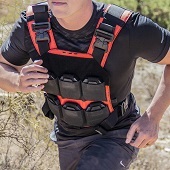 In this state, simply pushing down on the cummerbund of the Quick Release Plate Carrier will allow the carrier to drop free and completely detach from the back panel. Built in plate retention straps in the front & back armor pockets allow you to easily adjust the position of your body armor. Both the padded shoulder straps and the cummerbund are fully adjustable for girth while still retaining the quick release functionality. Standard rear mounted drag handle is also included. Velcro loops across the front, shoulders, and rear allow you to guide your hydration tube & or radio accessories.